An experienced actress with a native Edinburgh, East Coast Scots accent. An engaging, strong, deep and characterful voice that lends itself well to corporate video, documentary and IVR. She can put personality and character into her performance and is an excellent storyteller. 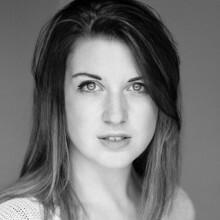 She studied at the Royal Conservatoire of Scotland as a member of their Theatre Company and recently finished a 5* Tour of Trainspotting around the UK. As well as her native Scots, she can also speak in an American and RP English accent.